The whole purpose of a warm-up game is to warm-up the participants in you class. A good warm-up game will have all the participants active for most of the time. You can't get warm if you are standing or sitting around doing nothing. Games that require students to go out (and stay out), or stand / sit for a long period of time are not effective warm-up games. Those styles of games have their place, but warm-up is not one of them. These games are not just for gymnastics, they could be used for any p.e. session. Again, there is no going out! If you absolutely must play a game with kids going out, then the out should not be permanent. Send them over to a mat to do ten tuck jumps or something, and then they join straight back in. The activity they do if they are out should not be focused on by the class. Start the game up again whilst they are out so they are not the center of attention. Safety tip! I normally don't let students run during a warm-up game. 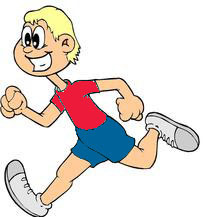 When kids are running they tend to not pay as much attention to where they are going. During warm-up they are normally that excited about what's coming next, that in my experience running = crashing = tears. I don't like tears, so I tend to use skipping, or other locomotor patterns to replace running. Important: There is no going out in this version of the game! Nice and simple game, students are skipping, hoping, jumping, side stepping, etc.. around the room. When the teacher stops the music the students have to freeze. A good game for introducing new movement patterns - when they freeze introduce something new, when you start the music again they now need to move around that way. I often use this game in the first week to introduce motorbike landing shapes. About half way through the game when the kids are all spread out I'll stop the music and teach motorbikes. Then we start the music and continue the game. Again, there is no going out! Scatter various shapes of different colours around the warm-up area. Whilst the music is playing, students skip around the warm-up area. When you stop the music, call out a body part and a colour. Students need to quickly put that body part on the colour you said. This is an example of a bad warm-up game (exception only for special needs classes). The majority of the time, only one student is walking, the rest sit and do nothing. This game normally works fairly well, but make sure that all students are included equally by the group. If someone gets stuck for too long, you may need to help them yourself. The size of the class and the room will determine how many taggers you start with, for younger groups I have about 4 for every 25 children, older groups I may have 6 or 8 taggers for a class of 25. The taggers stay the same for the duration of the game. When you get tagged you need to freeze and stand in a star shape. You stay stuck in that shape until someone crawls through your legs. Taggers cannot stand there and wait for you to get saved, and they cannot tag people whilst they are saving. Extension: If someone saves you, then you have 10 seconds to save someone else otherwise you are stuck again. Variations: Front Support Tiggy (a.k.a. Stuck in the Muck) - Instead of making a star shape, make a front support shape. Everybody can tag. You must keep moving at all times. If I see you still, then I will send you to hospital. When you tag someone, you must only use your fingers. When someone tags you, hold onto the part of your body that was tagged and keep skipping around the room. Get tagged again and use your other hand to hold onto the new spot. When you have run out of hands (get tagged the third time) then you must go to hospital. Hospital - designate an area that is just for the hospital. Students can't skip through the hospital. To get out of hospital you must do (maybe 30 tuck jumps, maybe rock 3 times in a tuck shape and stand up without using your hands, maybe 5 push-ups, etc...). In my book this is not a warm-up game. By definition warm-up requires you to be moving. You are not getting warm if you are sitting on your bottom like a clump of seaweed just waving your arms around. The winner will get warm, the octopi will get warm, but everyone else will have cooled down by the time the game is over. Choose 3 or 4 octopi. They stand in the middle of the court; everyone else stands at the end of the court behind the line. When the octopi call out 'octopus' everyone must try and get to the other side of the court without been caught by and octopus. If caught, you sit down where you were caught and become seaweed (seaweed must keep bottom on the ground, but can reach out and tag with hands). Game continues until last person is caught. Everybody is moving around the room, 2 - 4 people are the taggers. When the tagger gets you they say 'tag', now you are the tagger, and they are not the tagger any more. Now you must tag someone and say 'tag'. Watch out for younger students, they struggle with the concept of not been the tagger anymore, and waiting to be tagged before they can tag someone else, and tend to just skip around the room tagging everyone. When playing this game for the first time with young students, I have found it helpful to use some sort of object that must be passed (not thrown) on to the new tagger, they cannot tag unless they have the object, then they give it to the person they tag. Shark Island - when you are the tagger you put your hand on your head with your fingers pointing to the roof. When you tag someone you say 'shark'. Now they are the tagger, and you're not the tagger any more. Choose a few objects in the room to be islands. When you are standing on an island the shark can't get you. If you'd like to get onto an island, you must say 'excuse me' to the person already on there. They must get off and let you on instead. You can't go back to the same island twice in a row. Have about 6 taggers. Taggers alternate what they say - either 'dish' or 'superman'. When the tagger gets you they will say either 'dish' or 'superman'. You must stop where you are, lie down on the ground and hold the shape you were told for 4 seconds. Then get up and go skipping again. I often say that taggers can tag each other as well. Extension: Introduce music; they hold the shape for 8 beats. Earthquake - stop and shake on the spot. Volcano - Run to the North end to get away from the lava (just point, I normally wouldn't use 'North' unless we are playing with an older group and trying to teach a compass as well). U.F.O. - bob down and scream! These are some of the most common games that I use in schools (the thumbs up ones - the thumbs down ones I often see played in the guise of warm-up), but I have heaps more, and am notorious for inventing new games on the spot. Would you like to see more? Share this article on Facebook so I know you like it, and / or send a tweet to @gymnastics4hire.